Both the Family Court and the Federal Circuit Court are located in the Commonwealth Law Courts Building on the corner of George and O’Connell Streets, Parramatta (directly opposite Parramatta Park). When you first arrive at Court you will have to pass through an airport style security check. This involves passing any bags through an x-ray machine and walking through a metal scanner. If the scanner beeps, a security officer will pass a hand held metal detector over you to check more thoroughly. This is to ensure the safety of all attending the Court. There are also security cameras throughout the building, the full time presence of Federal Police and, when necessary, the State police as well. If you have any security concerns then please advise our office and the Court before your Court attendance so that the necessary security arrangements can be made. Which Court Are You In? The best guide is to check the Court lists. These are on a board located to your left as you make your way through the security checkpoint. Your solicitor may have already given you directions, or you may have been to the Court before, but if in doubt check the boards as you enter or ask at the Reception Desk (at the entrance near security). It is busy at the start of each Court day so it is best to get to Court at least 15-20 minutes before your Court start time to ensure you have enough time to sort out where you need to be. As you enter the building you are on the first floor. The Counselling Section and filing counters are located on the first (or ground) floor. Most of the Court rooms are on the second floor which you can reach via the stairs that are directly in front of security as you enter the building, or via the lifts. Anything on the third floor will require the use of lifts. This includes the Registrars Section where Case Assessment and Conciliation Conferences are conducted in financial matters. The lifts are located to the left of security when you enter the building. 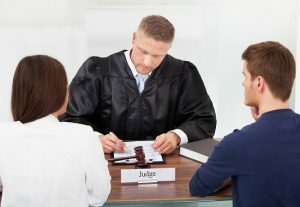 It is preferable that you do not bring children to Court unless their attendance is necessary (such as to see a children’s representative, be interviewed by a Court Counsellor for a family Report or when the Court has ordered that they be brought to Court). The Court has a child minding service (located in the Counselling area), however, the service is limited and is not always available. If you need to use the child minding service then you will need to phone the Court on 1300 352 000 at least one day before to book a place. All floors have toilets (located to the Eastern (Sydney) side of the building). On the ground floor you will find the toilets next to the information boards with the daily Court lists. The toilets are in the same positions on all floors. Court Support volunteers can provide tea and coffee on the second floor and there are also a number of soft drink and snack vending machines on the second floor. More substantial refreshments are available from a number of cafes immediately outside of the Court building. Dress neatly. No-one expects you to wear a suit or equivalent, just be comfortable but show the Court that you are taking it seriously and respectfully. Bring a book or some company. Avoid bringing anyone who will inflame your dispute, but a support person or something to read is advisable as you may need to wait around. If at all possible, try to get all day parking. There is nothing worse, or more disruptive and distracting, than having to constantly move your car or be worrying about parking tickets. There are a number of all day parking areas (costing $9-$16) within walking distance of the Courts. Horwood Place (off George Street).